If not, I don’t blame you – who can focus on fall with the weather still reaching the 90’s? But, just in case you’re lowkey over summer and craving cooler weather, here’s a fall transition piece to get you started. 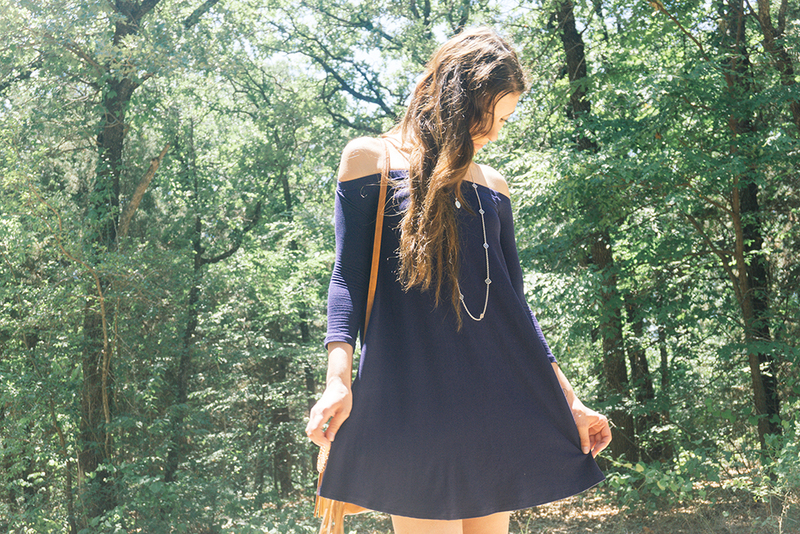 The off-the-shoulder quarter sleeve dress. Pretty enough to wear alone and comfy enough to wear everyday if your heart desires. Doesn’t look like off-the-shoulder pieces will go out of style any time soon, so it’s safe to say that they will make their way into our fall wardrobes and possibly even slightly into winter. Off the shoulder pieces are great summer to fall transition pieces because you can keep cool during the warmer fall weeks and stay stylish. Long sleeve off-the-shoulder tops and dresses are already making their way into fall trends. So, how do you wear a versatile off-the-shoulder dress? However way you want to wear it, of course! But, if you still need help, here’s how I paired of my favorite fall transition pieces. First, you need to think about where you’re wearing your dress to or what the occasion will be. You wouldn’t style it the same way for date night as you would for attending class. For this post, I wanted to be as versatile as I could in order to show how many different occasions you could wear the dress for. Here, I paired my dress with layered necklaces, a casually playful bag and some espadrilles. Like I’ve mentioned in previous posts, the type of shoe you wear can really set the mood for your outfit. I could’ve paired the dress with some converse, but it wouldn’t have the same feel as it does now. If you’re wearing the dress for date night, a night out with friends, or you just want to dress up your look, then pair your dress with some heels, fancy flats or sandals. If you’re wearing your dress to a casual hang-out with friends, pair your dress with some converse or casual sandals. Not only do the shoes play a big part in making your outfit, but the bag you wear does as well. Here, I paired my outfit with a casual brown bag with tassels. The tassels make it look playful and casual enough for almost any occasion. Don’t be afraid to add a pop of color to your look to make it more playful. Lastly, the color of the dress can also make or break your outfit. You know how there are just some colors better left to certain seasons? Well, you could never go wrong with neutrals in fall. If you missed it, here’s a previous post on how to wear navy as a neutral.